Subaru’s first-ever 2014 XV Crosstrek Hybrid model was just recently unveiled at the 2013 New York International Auto Show last month and it comes with the brands distinctive features that have made the brand so popular among young active buyers. It features Subaru’s excellent Symmetrical all-wheel-drive system and 8.7 inches of ground clearance for off-road capability. But what kind of fuel mileage will the new Subaru XV Crosstrek hybrid offer buyers? The good thing about the new XV Crosstrek hybrid is that it will feature the same low center of gravity and superior weight balance as the gasoline model. This is because Subaru uses the same horizontally-opposed Boxer engine that sits low in the chassis. But new to the hybrid model are the components for the hybrid system such as an electric motor and a high voltage battery. By using a motor assist function, both smooth acceleration and enhanced fuel economy have been achieved. Subaru says the new 2014 XV Crosstrek Hybrid model will achieve 20.0km/liter (47 mpg) from the Japanese JC08 test cycle that was conducted for the new XV Hybrid. This test cycle is is expected to be more “real-world” and meets Japans new more demanding 2015 Fuel Economy Standards ahead of time. And all this is accomplished while maintaining Subaru's unique Symmetrical AWD layout. Subaru built their own in-house hybrid system and didn’t rely on existing technology from another automaker. It uses a transmission that was developed exclusively for the hybrid model. It’s based on the already efficient Lineartronic (CVT), but an electric motor was installed behind the primary pulley. The Hybrid electric motor sits in between the transmission and the drivetrain. A 2.0-liter DOHC four-cylinder gasoline engine was partially modified for the hybrid model, and Subaru says they included engine friction reduction techniques in the modified engine. A key factor for the new XV Crosstrek hybrid is that it still maintains the same overall front rear weight distribution and the low center of gravity that gives the crossover its distinctive driving characteristics. By compactly housing heavy parts for the hybrid system such as the high voltage battery under the cargo space, they remain the same as the gasoline model. The batteries are mounted in the tire well keeping the overall footprint of the XV Crosstrek basically the same. The hybrid system offers EV (Electric Vehicle) driving at low speeds and motor assist driving at medium speeds. 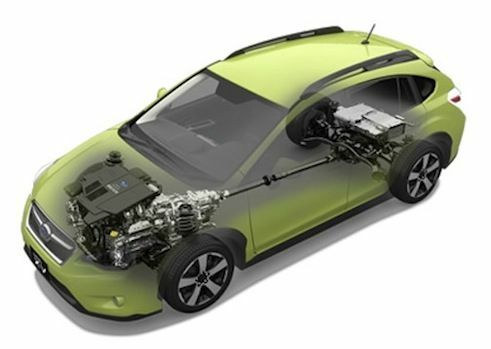 Thus the Subaru XV hybrid achieves both enhanced fuel economy and a responsive driving experience. The electric motor provides 13.4 horsepower and more importantly, 48 lb ft of torque. This will increase extra boost while driving and increase the fuel economy. The hybrid system can be driven in electric-only mode up to 25 mph. The new XV Crosstrek hybrid maintains Subaru’s off-road capability, safety rating and the rear cargo capacity is exactly the same. Buyers can get the best of both worlds with the hybrid with its excellent fuel economy. This hybrid vehicle will be introduced to the Japan market early this summer. Look for the 2014 Subaru XV Crosstrek Hybrid model to arrive in U.S. showrooms in the fourth quarter of 2013. Watch the Subaru XV Crosstrek Hybrid report by National Product Manager Dominick Infante.